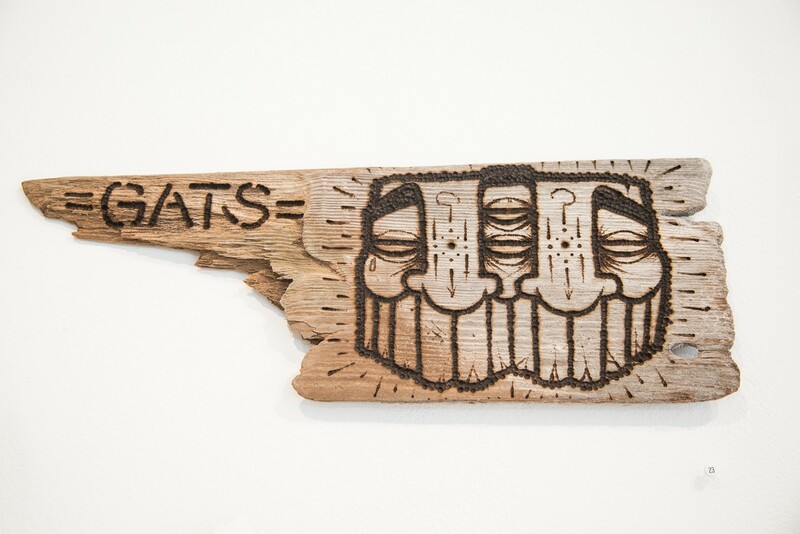 In his new solo show, GATS explored materials he can't use in his street art. Drifting Forest runs through May 30. HashimotoContemporary.com. 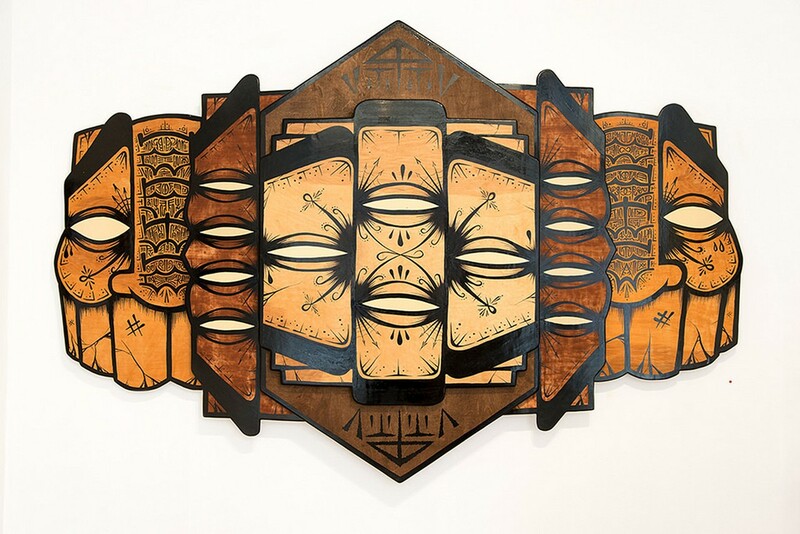 This past weekend, an eager line of street-art enthusiasts formed around the block outside Hashimoto Contemporary gallery in San Francisco, awaiting the opening of Drifting Forest, a show of new works by Oakland-based artist GATS. The crowd was no surprise, considering that GATS has a devoted fan base. The iconic mask he paints all over the Bay Area and beyond resembles a wise man's face, with tired eyes and a tangled beard. 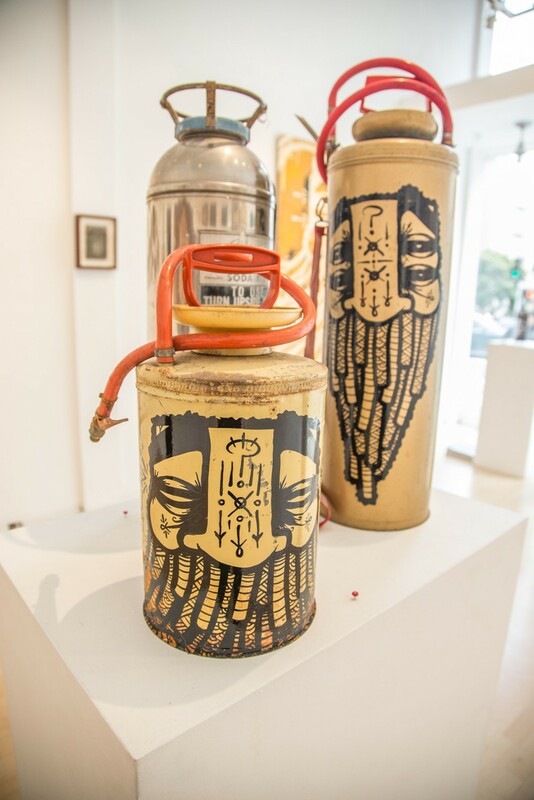 But despite the cultural weight that has amassed around the artist as an icon of Bay Area graffiti, few people are familiar with the myth behind the GATS mask, or even what "GATS" originally stood for: Graffiti Against the System. The anonymous GATS began painting the acronym in Los Angeles in about 2005, as part of a campaign he started with friends that aimed to use graffiti as a way to give political voice to city dwellers who don't have it. When he took the tag to the Bay on his own, it gradually became his own urban moniker. 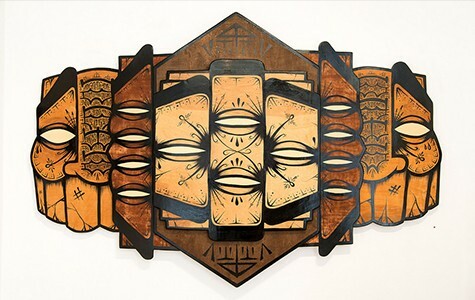 Over the years, his signature lettering and imagery have evolved to become increasingly elaborate. Now, in Drifting Forest, GATS disassembles the elements in his paintings, proving that they are recognizable on their own. 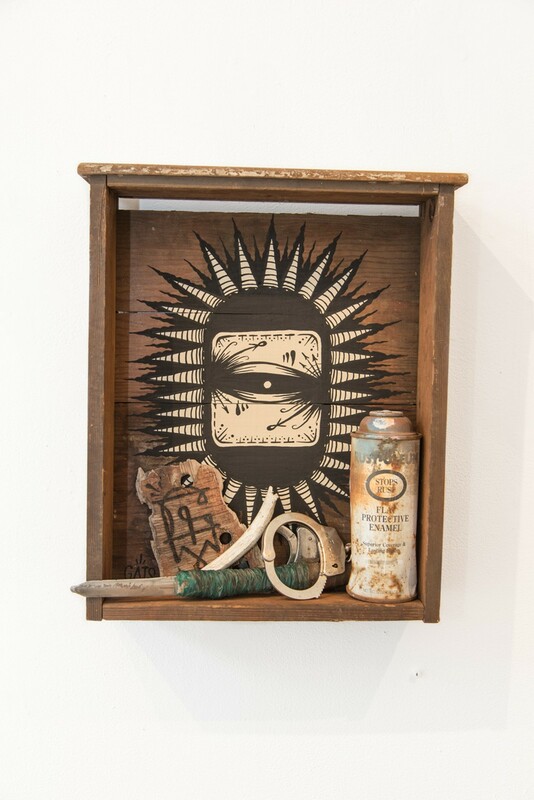 The paintings in the show appear on massive saw blades, old gas canisters, and a weathered book cover — all representative of the gritty yet whimsical aura of his work. It's a little odd to see GATS on clean, white walls, but it's a crucial part of his practice to sell art in order to make more that's free. He also included a variety of small pieces made of hand-burned driftwood that ranged from $50-$200 — as proof of his dedication to accessibility. I conducted a recent Q&A via email with GATS to shine a light on his enigmatic character. What's the meaning behind the GATS mask? I began painting the mask when I was in the Middle East. I encountered so many cultures and languages. I quickly learned that, for many people, the language you chose to write in was a declaration of your political allegiance. You were choosing which culture you wanted to speak to. Painting the mask, for me, was signing a petition for coexistence. Instead of addressing a single group, I chose the most recognizable symbol in the world: The human face. It is the first thing you see when you come into the world. It's a fresh start with no learned prejudices. I could write an entire book about the mask and how it has evolved over time. What it really is, though, is a narrative of my life, adventures, and cultural exchanges [that] I've made painting [in] ten countries over the past seven years or so. If I was really going to sum it up, I'd say it's about duality and the struggle between the realities placed upon us and the world we would like to live in. Graffiti Against the System, that's pretty political. Beyond the obvious illegal aspects of graffiti, in what ways do you think that the art form transgresses [goes against] authority? The illegal aspect is pretty important. No art is made without context. Graffiti transgresses authority because anyone can do it and there is no way to censor it. In the context of fine art galleries, one is always held prisoner by meeting the overhead of keeping that gallery open. Without overhead and shielded from self-doubt by anonymity, the graffiti writer is absolutely free to experiment and pursue true creativity. You often use lettering as textural detail in your work. What types of words and phrases do you like to write? This is always changing, [but] most commonly, within the face, I write the names of people I paint with or respect. The denser the population becomes in urban areas, the more alone we feel. With traditional family structures breaking down in society, we tend to create our own tribes based on those who have earned our trust and share similar beliefs. I paint the mask for these people. Sometimes I create borders of text that pay homage to certain movements in history. 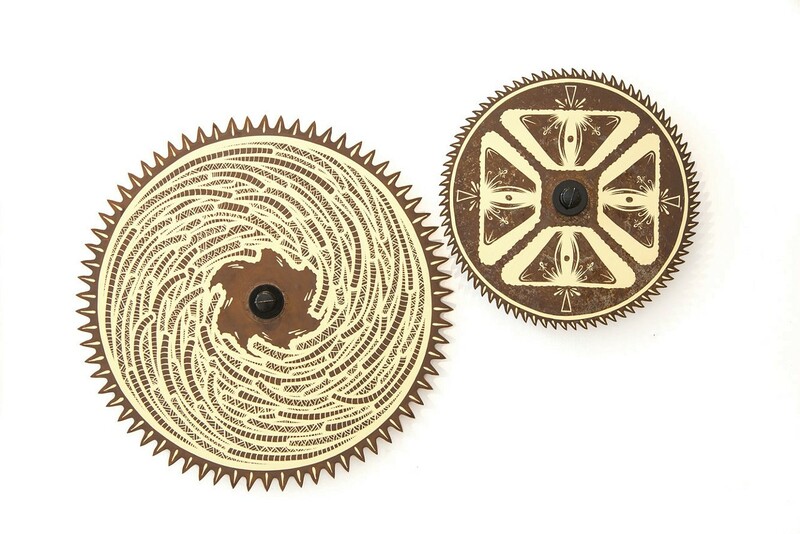 We all have counterparts in other countries and other times — friends we've never met. I reference their struggles with texts from books, folk songs, or other obscure sources. You've done a lot of innovative work, from writing a poem across a whole city, to giving away vegan burritos in a painted newspaper box. What's your personal favorite? My favorite is always what I'm plotting to do next. The best feeling in the world is surprising people. I had a really fun night with [graffiti artist] Optimist once. We randomly climbed up to cut down a billboard because we were bored with graffiti. Then, we spontaneously cut our names out of the vinyl in giant stencil letters. Something about sitting five stories up, perched on the back of an oversized billboard, watching cars drive by through huge letters you cut just plasters the biggest smile on your face. Not that it was the best-looking piece, but because it really made people go WTF? Tell me about the work in this show. What does "Drifting Forest" mean? In a literal sense, the majority of the work was done on panels I constructed from driftwood and other objects I found in the San Francisco Bay. On a deeper note, Drifting Forest is my longing to have a relationship with nature, only to watch the forest drift farther and farther away. I attempt to grow food in containers on top of concrete I don't own, and the only native trees I see float in from the ocean, disregarded as trash. These skeletons of the forest are sacred as I mourn in the graveyard that is urban sprawl. Judging by the fact that you paint a mask, and you're secretive about your identity, anonymity seems very important to you. Is it just a practicality that comes with the lifestyle, or is there more to it than that? There is the obvious necessity to avoid getting caught if you want to continue painting without permission. We live in a world [in which] employers, landlords, cops and the entire system of people who have authority over your life discriminate. The duality of the mask is being able to live how you want and still be able to survive behind enemy lines. Anonymity is free speech. Privacy is a right. Surveillance is intimidation. With that aside, I would still choose to be anonymous. I don't want personal recognition. I'm not seeking high fives in the street. In a way, I'm disassociated from GATS. I'm me and GATS is GATS. It has a life of its own. When I'm gone, GATS will still be here. Maybe it will inhabit another artist and manifest as a different image. What is it like seeing your work fill up a fancy gallery? Does it feel out of place? Coming from a graffiti background, my mentality was to be omnipresent. I didn’t expect to achieve it, though. I definitely feel uncomfortable in the fine art world. That’s why I prefer to hand my paintings off and just go paint the town during my openings. Are you afraid of losing your political edge by moving your work off the street and into a gallery? I haven't moved any work off the street. I've used gallery shows as a resource to paint the streets internationally. I've used them to raise money for causes I support. Most importantly, I've used galleries so that I can make art full-time without distraction. In the gallery, I play with mediums that are not translatable to the streets. Life is boring if you only stick to one thing. I intend on continuing my street work as long as I am physically able ... and maybe a little after that. Do you care if people refer to you as a graffiti writer or a street artist? Is there a critical distinction there for you? Language will always be manipulated based on the user’s perspective. You can call me what ever you like. I believe in making artwork accessible to everyone, regardless of the legality. The vast majority of my work is painted in the streets for free. When I have an art show, it is free to attend and view. Most people don’t attend galleries, which is why I attempt to bring the work to them. … I generally call myself an artist. Graffiti is an action I do. "Street Artist" is a marketing term too often used by people who don’t actually work in the streets. Being a muralist is a respectable thing… it doesn’t need to ride the coat tails of another subculture. You've painted in many countries, but you always come back to Oakland. Why here? This is where I’ve found the most like-minded community of people. I was a vandal until Oakland told me I was an artist. Place is irrelevant, but people make or break a town. I owe a lot to the early-on support of Roberto Miguel, Mama Buzz (RIP), Rock Paper Scissors Gallery, Political Gridlock, NMG Productions, all of PTV (Punks Thugs and Vandals) and all the writers, artists and comrades that make up the East Bay community. Hopefully these new condos will have all $300 rooms so that we can all continue to stay here. Sigh. I’m always on the move, but the West Coast is definitely home. No disrespect East Coast, I’m going to keep painting you, too.